The man, who uploaded a photo of the quiz to Reddit, declined to provide the name of the school for privacy reasons, but contended that the photo was indeed real. He said that his daughter attends a private Christian school because he and his wife believe that the public schools in their area are substandard. He stated that he does not mind the she is being taught about God, but became angry when he saw the content of her recent science quiz. The test included five questions about gravity, such as “Because of gravity, a ball thrown in the air ___,” providing multiple choice answers. The last two questions spoke of God’s involvement in the law of gravity. The conversation soon went viral, with reportedly thousands of comments accumulating—mostly negative—including from those who professed to be Christian. 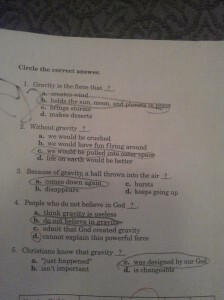 As previously reported, a similar situation took place this past spring when Blue Ridge Christian Academy (BRCA), a small private school in northern South Carolina, came under fire after administering a Christian-based science quiz to its Fourth Grade class. As the answer to one of the true-or-false quiz questions, “The earth is billions of years old,” was false, the father of a girl who attends the school became angry and threatened to pull her out. The quiz was circulated online and hundreds sided with the girl’s father, expressing their concern and even outrage regarding BRCA’s science curriculum. However, many Christian apologists and scientists came out in strong support of BRCA, a school that had been struggling with debt and various financial challenges. Most notably among supporters was Answers in Genesis, the largest Christian apologetics ministry in the world. Ken Ham and Mark Looy, co-founders of Answers in Genesis, stated in a blog post that they were “highly impressed” by how the BRCA staff had been coping with the controversy. Nonetheless, the school closed its doors earlier this year when it failed to generate enough donations to enable the school to keep going. BCRA states that it was only able to raise $15,000 out of the $200,000 needed to stay open.